1. Take out equipment and ingredients. 2. The night before or 3-4 hours before cooking or in the morning if you are home: Combine salt, sugar, cold water and lemon juice in a large mixing bowl. Stir. Rinse chicken inside and out under cold water. 3. Place chicken in a large re-sealable freezer bag. 4. Place bag in a large plastic ice cream bucket or pot to make it easier to fill the plastic bag with water. 5. Add salt water mixture to bag. 6. Place cinnamon sticks in bag, seal and refrigerate. 7. 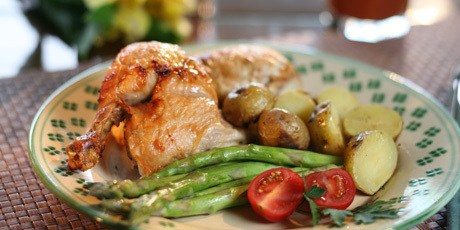 2 1/2 hours before dinner: Preheat oven to 325º F. Drain chicken and wipe with paper towels. Place on a rack in a shallow roasting pan. Insert a meat thermometer into thickest part of the breast. 8. Cover with foil and place in preheated oven. Set timer for 2 hours then remove foil for an additional half hour of cooking. Thermometer should read 170º F when chicken is ready. 9. Just before dinner: Combine rice and water in a large microwave-safe pot or casserole with lid. 10. Microwave at high for 10 minutes, then at medium for 10 minutes. 11. Rinse asparagus and snap off bottom ends. Place in a microwave-safe pot with lid. 12. Microwave at high for 4-5 minutes. 13. Add butter and salt if you must.